m. Sarah Grace Clarke, 28 November 1839. Their marriage was the first one conducted in St. Anthony's Church, Davenport, Iowa. Mr. and Mrs. George L'Oste Davenport had seven children together. Mr. Davenport also had daughter, Chiniha, who was also known as Jennie Davenport. George L'Oste Davenport was George Davenport's first-born son, born on the island of Rock Island. He grew up with Meskwaki playmates where he learned the language of the Ho Chunk and Sauk and Meskwaki. He was adopted into the Meskwaki tribe and given the name "Musquake." He attended schools in Cincinnati, Ohio, Jacksonville, Illinois, St. Louis, Missouri, and Winchester, Virginia. At a young age he became a partner in his father's Indian trading and in the mercantile business of Davenport & LeClaire in the town of Davenport. 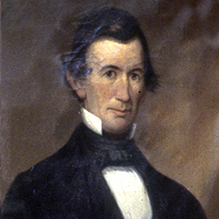 He was active in city developments, one of the town's first trustees, and elected alderman of the Fourth Ward from 1861 to 1865. At one time he was engaged in the manufacture of flour and, with cousin James Bowling, bought a distillery in Davenport. He was involved in the organization of the Mississippi & Missouri railroad company and served as one of its directors. He partnered with Antoine LeClaire in building a foundry and machine shops. He helped to organize the first gas company in Davenport and served as its president. He owned large blocks of stores, but suffered financial ruin in the 1870s. 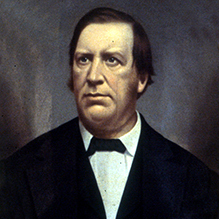 In 1879 he was appointed Indian Agent to the Meskwaki. He died of heart disease in St. Augustine, Florida, where he had gone for health reasons. div. 25 March 1861, with no children from this union. Bailey Davenport had two sons: Harry Davenport, also called Wakimawita, whose mother was Hianope, and Joseph Hilbring. At an early age, Bailey Davenport became interested in horse-trading and horse-breeding and was placed in charge of the Davenport farms. He was a large property owner and raised some of the finest horses in the Rock Island area. He owned and operated stone quarries, sandbanks, and coalmines. He established the Rock Island & Milan steam motor railway, which ran to Black Hawk Watch Tower, which he developed into an amusement park. On some of his city property he laid out three additions to the town of Rock Island and one to Moline. Other property was rented and developed for manufacturing of lumber and other businesses. He was elected mayor of the town of Rock Island for seven continuous terms during the Civil War (1861 – 1866) as a Democrat. He was one of the organizers of the Merchants' State bank in Davenport as well as the Peoples' National Bank in Rock Island, of which he was a board member and president at the time of his death. His death from pneumonia at the age of 67 was sudden and unexpected. m. Nicholas Ferkle, 5 March 1852, in Monroe County, Illinois. Mr. and Mrs. Ferkel had fourteen children together. Elizabeth Davenport was born in the Davenport House on the island of Rock Island and moved with her mother to east St. Louis, Illinois, about the age of six months. She married Nicholas Ferkel at the age of sixteen. 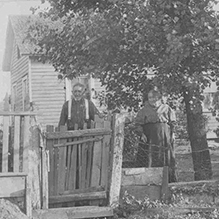 They farmed in Monroe County, Illinois, until moving to Rock Island County in 1869. They celebrated their Golden Anniversary in March of 1902 with their children and grandchildren. Her death was a result of burns suffered when her clothing caught fire while she was cooking breakfast.